Throughout the 2017-2018 academic year, 349 University of Washington students and 26 UW faculty members worked with staff and community members from the City of Tacoma on projects to advance livability and sustainability in the city. The year-long partnership between Tacoma and UW Livable City Year (LCY) provided the city with university resources to tackle 27 projects identified by city staff. Students worked on the projects and presented their findings and recommendations as part of their courses, and then after the class was finished produced in-depth reports and other deliverables. Several of the project reports are now available on the Livable City Year website, and details on all the projects are available in LCY’s 2017-2018 Summary Booklet. More reports will be posted to the LCY website as they are finalized in the coming weeks. The UW students put in more than 45,000 hours working on these Tacoma projects, providing nearly $1 million in value to the City of Tacoma through their research. The 27 projects addressed in Tacoma through the Livable City Year partnership touched on a wide range of topics. Faculty from eight different UW schools and colleges — from the Seattle and Tacoma campuses — led Livable City Year classes. Ten city departments participated, giving guidance to students throughout the term as they engaged in real-life applications of their coursework. Landscape Architecture students and faculty partnered with Metro Parks Tacoma to design usable green spaces in four gulches situated along Ruston Way. The students proposed designs to make each gulch usable and ecologically functional for residents and wildlife, while also placing a high priority on connecting the gulches to the waterfront and the larger Tacoma area. 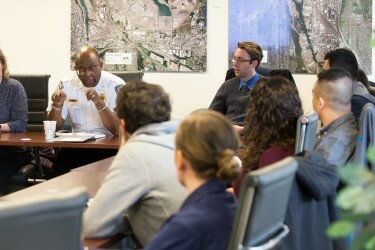 A team from the UW Tacoma Institute of Technology worked with the Tacoma Fire Department to create a web application to provide information on fire safety to local elementary students, which will foster engagement, awareness, and knowledge in the greater Tacoma community. Watch a video on this project. UW Architecture students worked in the South Tacoma and McKinley neighborhoods with the goal of creating National Register Historic District nominations. The classes researched the history of the neighborhoods and buildings, and met with neighborhood residents. The student research has laid the groundwork for creating historic districts in these neighborhoods. The partnership with Tacoma marked the second year of the Livable City Year program, and a major expansion. LCY worked on 17 projects during the inaugural partnership with Auburn in 2016–2017. The partnership with Tacoma also built on existing relationships between the city and UW Tacoma, and many of the student findings will inform city work for years to come. Livable City Year has partnered with the City of Bellevue for the upcoming 2018–2019 school year, and many UW faculty have already been coordinating with city staff on projects students will work on this Fall. LCY and Bellevue will celebrate the start of this partnership with a kickoff event on the UW campus on October 9 at 12 – 1:30 p.m., in Maple Hall’s Great Room, 1101 NE Campus Pkwy, Seattle. For more information on the Livable City Year program and the projects from each year-long partnership, visit LCY.uw.edu. UW’s Livable City Year (LCY) program is led by faculty co-directors Branden Born (Urban Design and Planning) and Jennifer Otten (Public Health). The program launched in 2016 in collaboration with UW Sustainability and Urban@UW, and with foundational support from the College of Built Environments, the Department of Urban Design and Planning, Undergraduate Academic Affairs, and the Association of Washington Cities. LCY’s Program Manager is Teri Thomson Randall. The program is modeled after the University of Oregon’s Sustainable City Year Program and is a member of the Educational Partners for Innovation in Communities Network.